A review into business practices at defence firm BAE Systems has called for tougher anti-bribery measures. The study by Lord Woolf, former Lord Chief Justice of England and Wales, set out 23 recommendations for the firm. 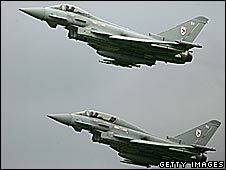 Lord Woolf said the report provided a "route map" for BAE to ensure it was a leader for its ethical standards. The review began after accusations that BAE made multi-million-pound payments to help win a deal from Saudi Arabia - though all parties deny any wrongdoing. The report said the firm should publish a global code of ethical business and strengthen its anti-bribery measures in the appointment, management and payment of certain advisers. The document also proposed a range of measures to strengthen board oversight of ethical issues through the Corporate Responsibility Committee. The BBC's business editor Robert Peston says that the report's finding, that in the past BAE did not pay sufficient attention to ethical standards in the way it conducted business, is an embarrassing admission. He adds that in the past, it has always been argued that defence companies could not be cleaner than clean if they wanted to win the biggest contracts and promote employment. Is there any sensible reason why reforms that are right for BAE shouldn't apply to the rest of British industry? However, because BAE has committed to implement Lord Woolf's measures, there will now be a very real test of whether commercial success and ethical conduct can be bedfellows. The BBC's business editor explains that while the report's findings are serious for BAE, there are also implications for all big British multinationals. Lord Woolf's proposals for BAE go much further than what most companies do to ensure that they do not stray into the moral dark side. As a result, other companies may now find it harder to argue that the reforms facing BAE should not also apply to the rest of British industry. The High Court ruled recently that it was unlawful for the Serious Fraud Office to have ended an investigation into BAE's al-Yamamah deal with Saudi Arabia. The £43bn deal was signed in the 1980s but continued into the 1990s. It involved BAE selling Tornado and Hawk jets, as well as other weapons, and also included long-running maintenance and training contracts. The fraud office said the probe would have undermined national security and it has been given permission to appeal against the court ruling. BAE has maintained that it acted lawfully. Following the allegations, BAE Systems charged the Woolf Committee with looking into how the company did business and asked it to publish a public report into the defence firm's practices. Lord Woolf said BAE had accepted it had no alternative "but to continue along the route of taking all practicable steps to ensure that the circumstances that gave rise to allegations of past misconduct do not reoccur in the future". He added that the report made a number of observations to the UK government, which "could and should do more to promote high standards of ethical business conduct and help protect the global reputation of all British businesses". The report however elicited criticism from the Campaign Against Arms Trade (CAAT). CAAT, along with the campaign group Corner House, had legally challenged the move by the SFO to suspend the probe prompting the recent High Court ruling. CAAT said much of the report was aimed at "internal processes relating to corruption and bribery" and the Woolf committee tried to distance the company from corruption allegations by stressing how BAE had changed over the past decade. "However, many of the allegations relate to more recent events and the attitude towards them is worrying since the present chairman and chief executive were in post when BAE lobbied to end the SFO investigation," CAAT said.